Citation Information: J Clin Invest. 2017;127(10):3730-3740. https://doi.org/10.1172/JCI93445. Maintenance of muscle structure and function depends on the precise organization of contractile proteins into sarcomeres and coupling of the contractile apparatus to the sarcoplasmic reticulum (SR), which serves as the reservoir for calcium required for contraction. Several members of the Kelch superfamily of proteins, which modulate protein stability as substrate-specific adaptors for ubiquitination, have been implicated in sarcomere formation. The Kelch protein Klhl31 is expressed in a muscle-specific manner under control of the transcription factor MEF2. To explore its functions in vivo, we created a mouse model of Klhl31 loss of function using the CRISPR-Cas9 system. 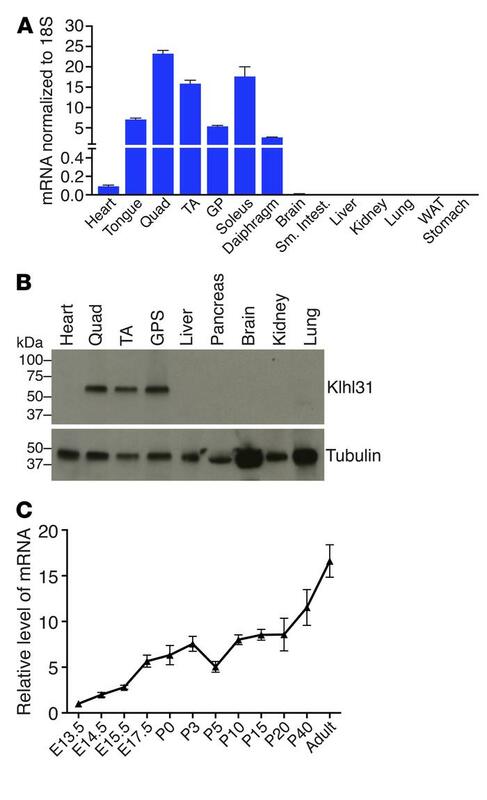 Mice lacking Klhl31 exhibited stunted postnatal skeletal muscle growth, centronuclear myopathy, central cores, Z-disc streaming, and SR dilation. We used proteomics to identify several candidate Klhl31 substrates, including Filamin-C (FlnC). In the Klhl31-knockout mice, FlnC protein levels were highly upregulated with no change in transcription, and we further demonstrated that Klhl31 targets FlnC for ubiquitination and degradation. These findings highlight a role for Klhl31 in the maintenance of skeletal muscle structure and provide insight into the mechanisms underlying congenital myopathies. Skeletal muscle-specific expression of Klhl31. (A) Quantitative reverse-transcriptase PCR (qRT-PCR) data from a C57BL/6 multitissue library shows the Klhl31 transcript is restricted to skeletal muscle, with relatively low levels in the heart (n = 3). Data are represented as mean ± SEM. Quad, quadriceps; TA, tibialis anterior; GP, gastrocnemius plantaris; Sm. Intest., small intestine; WAT, white adipose tissue. (B) Western blot analysis of Klhl31 protein expression using a C57BL/6 multitissue panel confirms that Klhl31 is expressed exclusively in skeletal muscle. GPS, gastrocnemius plantaris soleus. (C) Klhl31 transcript is expressed in the embryo and increases throughout development and into adulthood in striated muscle (n = 3). Data are represented as mean ± SEM.